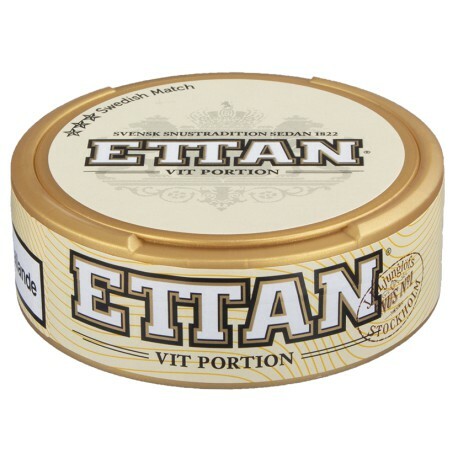 Ettan, the first modern Swedish snus was released in 1822, is now available in a white portion version. Ettan White Portion Snus is a full-flavored, slightly smoky snus with an unseasoned scent of tobacco. This is a white portion snus meaning it does not go through an additional wetting process during manufacture. This makes the pouch drier to the touch and gives it a whitish color, hence the name white portion. No rocket science here; otherwise SnusCentral.com Store Manager Moe Unz would have no idea how to describe this! I read great things about Ettan, and I did like it. I just thought it was regular tasting. But that isn't a bad thing if you want an everyday snus! Excellent sized portion that fits and no irritation. The Best tobacco snus I've had. All tobacco no other flavors are needed! If you love a awesome tobacco snus, get it! I ordered a can to try and fell in love with this flavor. It's easy to see why this brand has been around as long as it has. The flavor is mild, yet assertive, if that makes any sense. What I mean is, the flavor is easy-going, but never disappears or changes. It's the flavor of a high-quality, mild tobacco with just enough salt to really set it off and make it very easy to enjoy. I sometimes think of fresh cut hardwood when I open the can, but it doesn't taste that way. A very "wholesome" and high-quality snus that has stood the test of time, and for good reason. I ordered two rolls yesterday to help keep it around for another 194 years. It's the Platonic form of snus. Imagine the great hyle-flow of pure snus portioned up in little white bags and you have Ettan. A snus to enjoy in your study as you attempt an unprecedented synthesis of Heidegger and Wittgenstein. For this snus I say: Thanks Obama. I quit smoking seven years ago after stumbling on snus on the internet. I experimented with many, many different brands before settling on Ettan White as my regular brand. It's been the only one that I have ordered for the last three years. That says it all for me. I tried this once before, but for some reason never ordered it again. I just got this one in a bad o'snus and will be ordering it again. Nice, smooth tobacco flavor...not too string or harsh and just the right amount of drip. Heritage in a gold can. This snus is just what I needed to get into more than just mint from General. Mint will always be a mainstay, but so will this one. It tastes like pure peat moss smells: smokey earth. There is definitely Burley tobacco here, the slight cocoa undertone, and good South American tobacco that is reminiscent of Maduro cigars. It pairs wonderfully with black coffee, and is just a perfect well-rounded snus for those who love and appreciate the taste of pure tobacco. For those looking for a pure fresh tobacco taste in a white portion,you can count on Etan vit to deliver. One of my favorites for sure. I actually prefer Ettan White over regular Ettan. I tried Ettan my first or second order & did not like it at all. I got Ettan White in a Bag O' Snus order and I loved it. The regular Ettan's taste was too much for me at first. Ettan White was mellow and allowed me to take in the flavor. While I like Ettan regular portion, and this has the same basic flavor (very mild), I found myself wanting a bit more flavor in white portion. I would end up fiddling with the portion, trying to get it to juice up a bit more. Don't get me wrong, it has the same velvety flavor with an almost cocoa aftertaste, but the portion type simply makes the flavor much weaker and the nicotine slower to notice. If you find most snus formulas to be a bit strong, this might be the right snus for you. If you like more drip and a robust tobacco flavor, it will leave you wanting.